I am so excited, The Oxygen Hyalu Lift is now in the US. I have had it for the last 6 months to try before it came on the market and I enjoy using it with my other Karin Herzog products. The newest product to the Karin Herzog family, harnesses the power of hyaluronic acid and 1% active oxygen to create the ultimate treatment for aging skin. Clinically proven to visibly reduce signs of aging, the luxurious formula helps to replenish moisture, firm and smooth skin. 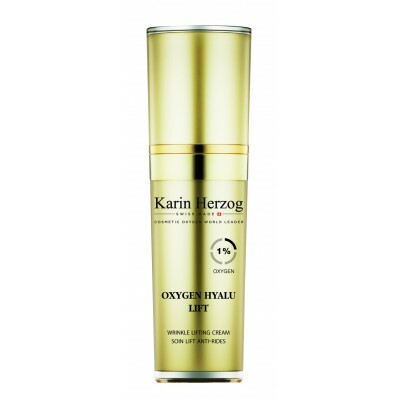 Oxygen Hyalu Lift features Dr. Herzog’s patented anti-aging technology which stabilizes active oxygen into an emulsion. Upon contact with skin, the enzyme, Catalase, works to convert the emulsion into pure oxygen, which is propelled into the skin along with the other active ingredients. This micro-massage effect flushes out debris and toxins, allowing nutrients to be efficiently absorbed through the capillary walls. Thus boosting the skin’s ability to hydrate and nourish, accelerate cell regeneration and diminish the appearance of fine lines and wrinkles. The wonderful marriage of hyaluronic acid and oxygen are the perfect blend for that synergistic effect on the skin. I have loved using mine Hyalu Lift on myself and on my clients. It is also wonderful to use with your facial devices for lifting and toning. To purchase this product, please go to my website http://www.karinherzog-jmilan.com My registered clients save on all my product lines that are not available to the public. Why use Karin Herzog? Dr. Paul Herzog, the creator, was a Noble Prize honoree for his work with Oxygen. It was his whole life. Karin Herzog products are the original, patented, proven formulas used and supported by Doctor’s and dermatologist’s globally. Karin Herzog is not about marketing or inventing creams for the sake of it they only want true results. No other cream, to this date has the remarkable ability to self massage itself deep within the tissues. There are many companies that have tried to copy it, but all have been unsuccessful. Not developed as a cosmetic but an aid to sterilization in medical applications. Amazing cosmetic results, forced the formula to become a truly advanced, medical grade, skin care range. Different from any other products because of oxygen and vitamin A. Karin Herzog are the only creams available that can trap oxygen and push it into the skin and have been proven to work by using a medical Oxygen Analyzer. We have documented clinical trials to prove the efficiency of the products and not one but two global patents for delivering oxygen and vitamin A to the cells proving these creams really are genuine.